The process of getting data into a chart, differs depending upon how your data is structured within Quick Base. 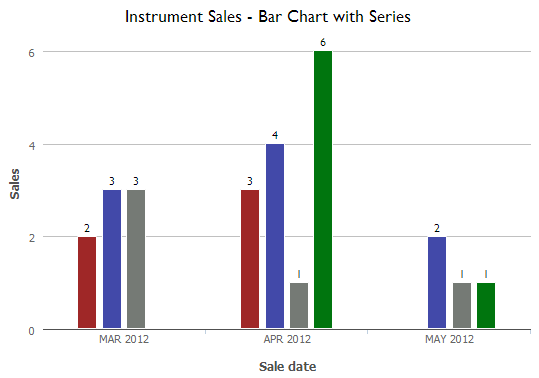 The Goal: A chart showing sales for each month, including bars for each individual instrument. How do you produce a chart like this? That depends on how you've entered this data into Quick Base. Do the values you want to show (in this case, instruments) exist as values within ONE field? Or do they each have their own field (column)? 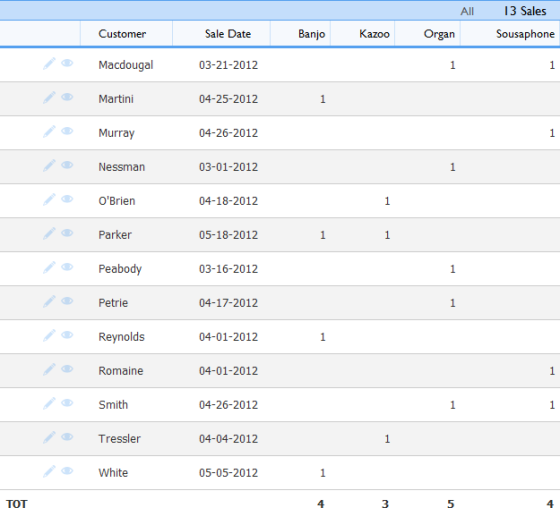 For example, the first image below shows a table report where instruments all live within one field. The second image shows a different setup. Each instrument has its own field. If you're not in the Report Builder already, create the report. 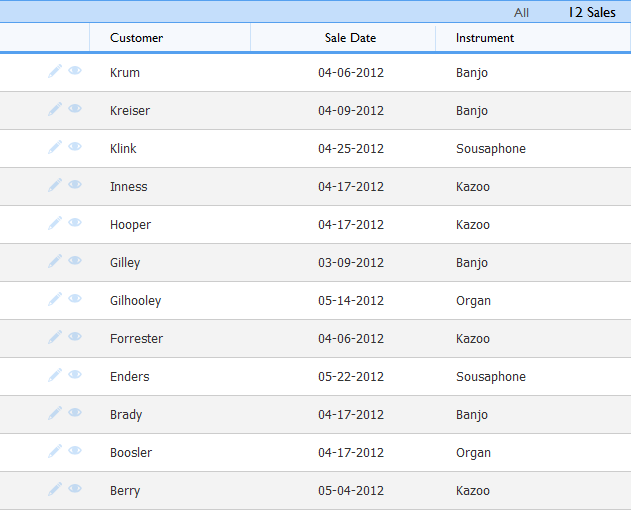 With a multi-field setup, your sales numbers are scattered across all the individual instrument fields (like banjo, guitar and so on). To get them all on your chart, you need to select each field in the Data (y-axis) values section, as pictured below. To add additional fields, click the plus sign icon that appears when you hover your mouse over the field you've already specified. You've selected a summed field from the y-axis dropdown. 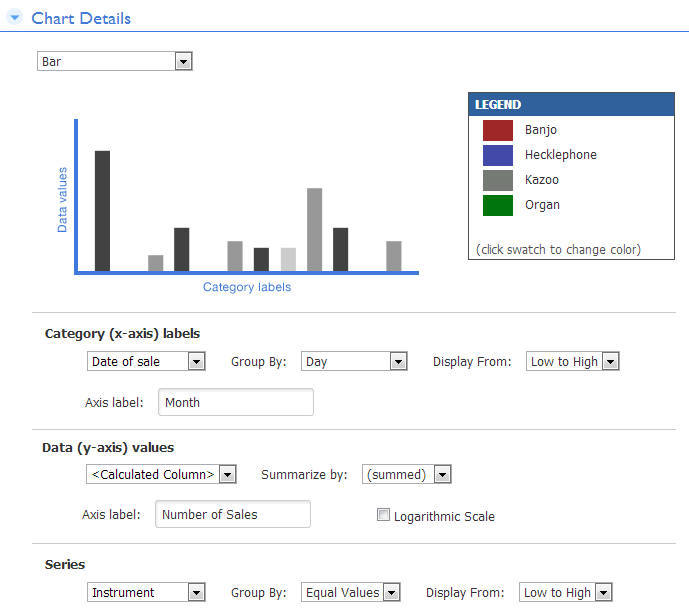 When you select a field that Quick Base sums (like # of Sales in above, you're already showing all possible values on the chart. Adding specific instrument fields here would be overkill. 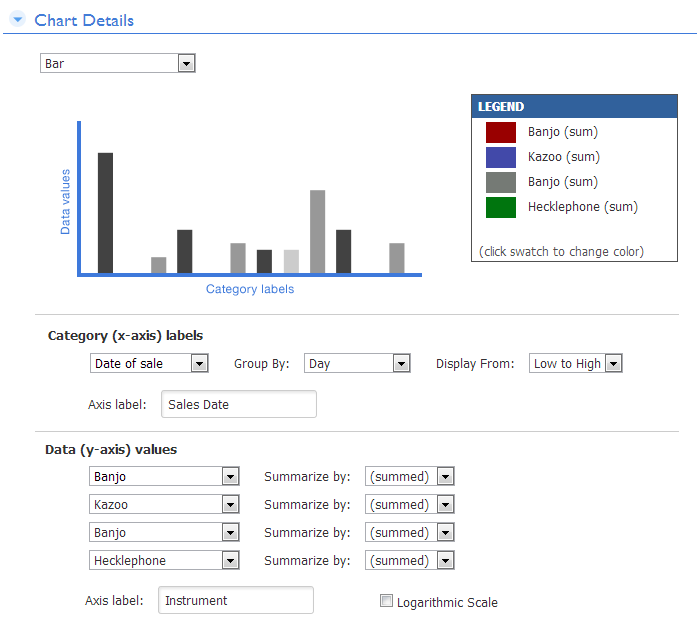 After all, Banjo or Kazoo sales are already represented on the chart—as a part of the total. To help you differentiate between field types within the dropdown, Quick Base puts summed fields bottom of the list in a separate section. The program displays the plus sign icon only when you select a numeric field that represents a PART of your total data. Once you've created a relationship, you can design a chart just as you would for either scenario above. Again, the trick is to look at your data and ask yourself, "Do the values I want to show live in one field or in separate fields?" If they live in a single field, select it from the Series dropdown. In a relationship, this may be a reference field to a parent table. If the values live in separate fields, you may need to create additional lookup fields to get them on your chart.